OrexCA.com provides Visa support only on condition of package tour booking! Document list, terms and dates of Visa preparation and Consular fees may be changed according to the regulations of the Ministry of Foreign Affairs of the Republic of Uzbekistan. OrexCA.com does not carry responsibility for the non-implementation or timeliness of Visa provision by the consular sections of embassies, nor is OrexCA.com responsible for Visa rejection. Should the Customer cancel their paid order, the service of Visa support shall be automatically terminated. It is only necessary for citizens of Armenia, Azerbaijan, Belarus, Georgia, Kazakhstan, Kyrgyzstan, Moldova, the Russian Federation and Ukraine to carry a passport (visa is not required). There is a simplified visa procedure for the citizens of Austria, Belgium, Germany, France, Italy, Japan, Latvia, Malaysia, Spain, Switzerland, the United Kingdom of Great Britain and Northern Ireland and the United States. To obtain a Tourist Visa, all other foreign nationals need visa support from one of the Travel Companies authorized by the National Tourism Company "Uzbektourism". Visa support application is submitted by the Travel Agency to the Ministry of Foreign Affairs of the Republic of Uzbekistan in Tashkent. The approval period is about 7-10 working days. The approved visa support is faxed directly to the Embassy or Consulate of the Republic of Uzbekistan in the country where the traveler is receiving the visa. Visa can be obtained in the Consular Missions of the Republic of Uzbekistan abroad. In the Tashkent Airport visas can only be issued to those persons who are arriving from the countries where the Republic of Uzbekistan does not have permanent diplomatic or consular missions. 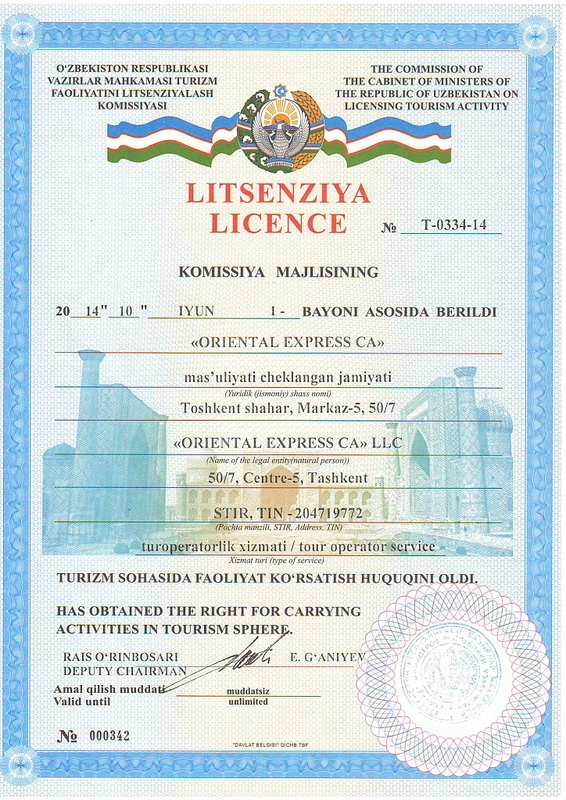 Our company has a license (#037-04) from the National Tourism Agency "Uzbektourism", which authorizes us to provide travelers with Uzbek visa support if required, provided you purchase one of our tour packages. up to 1 month - US$ 45 per person (children under 12 year -US$ 25). up to 1 month - US$ 15 per person. up to 72 hours - US$ 20 per person. up to 3 months stay - US$ 80. For each additional entry the fee of US$ 10 is charged. Group visa for 30 or more days per person - US$ 25.
for Double entry - US$ 40.
up to 30 days - US$ 50.
consular fees are paid at the Embassy of the Republic of Uzbekistan or at the consular department. 7. Evidence of purpose of visit. - one is flying to Uzbekistan directly from a country where Uzbekistan has no Embassy or Consulate. Copies of airplane tickets (which prove the above) should be submitted to the Ministry of Foreign Affairs in Tashkent together with the visa application form. If the visa support is approved, officials from the visa department of the Ministry of Foreign Affairs will issue visas at the airport. Validity period of visa for foreign passport holders in Uzbekistan may be extended at authorized branches of OVIR upon provision of valid reason for said extension. According to the Resolution of the Cabinet of Ministers of the Republic of Uzbekistan dd. 16.04.1999 No 178 foreign citizens visiting Uzbekistan on temporary basis must submit documents for registration at the place of residence within 72 hours upon arrival to Uzbekistan. Registration is not necessary if you arrive to Uzbekistan during weekend or holidays or if a period of your stay will not exceed three working days. During stay in a hotel your stay will be registered by hotel administration. Upon checking out you should remember of taking the registration form with you stamped by the hotel administration. Please note that Business Visa holders require special authorization to stay in private homes, which should be obtained prior to arrival in Uzbekistan. Ask your inviting business or organization to help you with this. Without such authorization, you will be required to stay in authorized hotels, where they will register you automatically. Travel around Uzbekistan by rail or land sometimes requires brief exits into neighboring countries. Travelers should have a multiple entry Uzbek visa and proper visas for the neighboring countries in order to avoid delays in travel. Please review your itinerary. Attention! In accordance with Part 1 of Article 225 of the Code of the Republic of Uzbekistan on Administrative Responsibility, the violation of a foreign citizen or a stateless person the rules of stay in the Republic of Uzbekistan, that is living without documents on the right of residence in Uzbekistan or with invalid documents, failure to comply with the established order of temporary or permanent residence, movement or choice of residence, failure to depart after tenure, as well as non-compliance with the rules of transit through the territory of the Republic of Uzbekistan shall be sanctioned by a fine ranging from fifty to one hundred minimum wage (from $2181 to $4361 - amount of fine specified in accordance with the exchange rate of CBU on January 29, 2014) or expulsion from the Republic Uzbekistan.